US President Donald Trump has talked tough on Beijing but America’s first family still has big fans in China. This is largely down to Ivanka Trump, who has helped soften her father’s confrontational approach towards Beijing in the eyes of the Chinese public. Her children have also featured heavily in the charm offensive. A clip of Ivanka’s daughter Arabella reciting Chinese poetry went viral in China shortly after Trump was elected — some interpreted her command of Mandarin as a sign of the Trumps’ hidden affinity for the country. Trump’s grandchildren were on show again at Trump’s Mar-a-Lago estate Thursday when the US President met for the first time with Chinese President Xi Jinping. According to the state-run Xinhua news agency, Arabella and her brother Joseph sang a Chinese folksong “Jasmine” and recited verses from the “Three-Character Classics” as well as Tang dynasty poems to the two presidents. 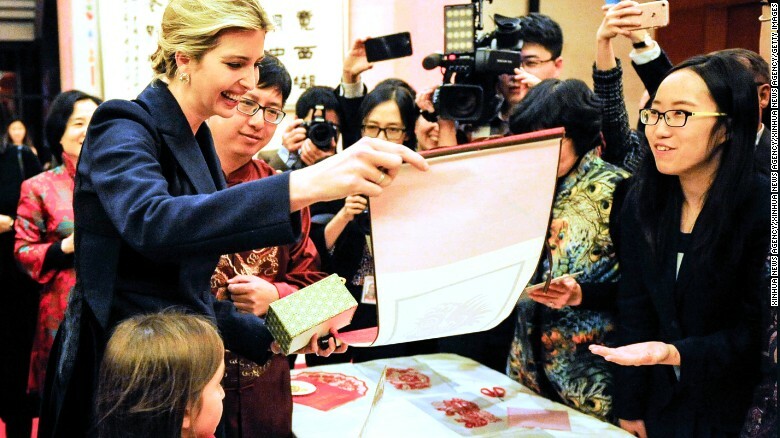 In February, after the White House failed to send the customary Lunar New Year greeting to Beijing, Ivanka and her daughter paid a visit to the Chinese embassy in Washington for a reception to celebrate the Year of the Rooster. The two were welcomed by China’s Ambassador Cui Tiankai, watched a musical performance and enjoyed paper and sugar sculptures — the event was featured in a prime-time newscast in China. Last month, Ivanka posted a picture of her youngest son, who had just turned one, enjoying a bowl of long-life noodles — a Chinese birthday tradition. Now with a formal White House role, Ivanka, along with her husband Jared Kushner, attended the lavish dinner with Xi in an ornate private dining room at Mar-a-Lago. Zhang Baohui, a professor of political science at Lingnan University in Hong Kong, said that Beijing has tried to court the US first family to smooth relations with Trump. “Beijing is keenly aware that Trump relies closely on a very small group of advisers to guide him on policy issues, including his son-in-law Jared Kushner and daughter Ivanka Trump,” he wrote in a February op ed for CNN. “Her appearance at the Chinese embassy, with a certain political and diplomatic significance, could be invigorating to the China-US relationship,” the paper said. Global Times also defended a factory that makes Ivanka Trump branded shoes against allegations of overwork and poor working conditions. Ivanka is known in China as baifumei — white, rich and beautiful — and a recent tweet by Xinhua, China’s official news agency, asked people to compare her with Li Bingbing, one of China’s most famous actresses. 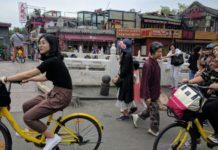 Many Chinese sense a business opportunity in the country’s fixation with Ivanka — dozens of firms have registered products involving her name, state media reported. They operate in fields ranging from cosmetics to under garments. Ivanka’s own businesses don’t yet have much of a presence in China. Some of her clothing and shoes are manufactured there but a jewelry boutique she opened in Beijing in 2013 closed in 2015, according to Buzzfeed. But at least one of her Chinese fans senses that Ivanka may ditch commerce and follow in her father’s footsteps. “Based on her beautiful appearance, her talent for giving speeches, ambition and political skills, plus her growing political and diplomatic experience during her father’s presidency, Ivanka not only possibly could be a second Hillary, but also may be the first female president in US history,” said Weibo user Mao Kaiyun 123. Ivanka Trump is fairly popular in the United States, but did you know she is called the “goddess Yi Wan Ka” Trump in China? Young Chinese women look up to Ivanka as a leader and a symbol of power and ambition. It helps that her children and husband Jared Kushner are particularly interested in the country. On Wednesday, Ivanka shared a photo of her 1-year-old son, Theodore, playing with building blocks with Chinese letters on them, showing he’s already familiar with the language.